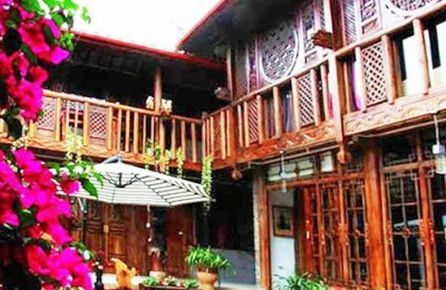 The Lijiang Wang Jia Courtyard Inn is located just outside the city of Liajiang, just a short distance from the Museum of Tea Horse Road, Lijiang Shuhe Ancient Town, and World Cultural Heritage Garden. 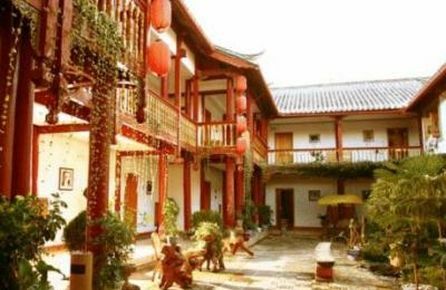 Lijiang Wang Jia Courtyard Inn has 16 comfortable and spacious guest rooms featuring traditional Chinese décor and furnishings. Each room comes equipped with a private bathroom, hardwood floors, and free wireless internet access. Guests of Lijiang Wang Jia Courtyard Inn will enjoy the hotels impeccable service and modern amenities, including an airport transfer service, common lounge, guided tours, shuttle service, and a restaurant serving delicious regional cuisine. Lijiang Wang jia Courtyard Inn in Lijiang! The Lijiang Chayuwu Inn is located in the heart of the city of Lijiang, just a short distance from the Museum of Tea Horse Road, Lijiang Shuhe Ancient Town, and World Cultural Heritage Garden. The hotel is also situated 45 minutes by car from the airport. 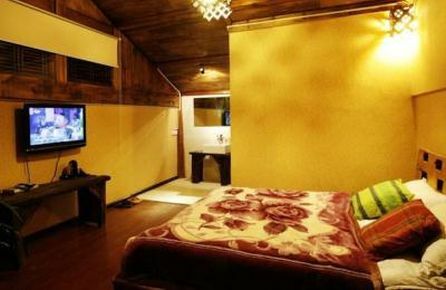 Lijiang Chayuwu Inn has 9 comfortable guest rooms featuring simple and rustic Chinese décor. Each non-smoking room comes equipped with a private bathroom, satellite TV, desk, and free wireless internet access. The hotel features professional service and modern amenities, including an ATM, business center, meeting facilities, TV lounge, guided tours, shared kitchen, BBQ facilities, and peaceful courtyard with garden. The hotel also offers a café, full-service bar, and a restaurant with 24-hour room service serving delicious regional cuisine. Lijiang Chayuwu Inn in Lijiang! The Lijiang Flower Inn is located in downtown Lijiang, within walking distance to all of the city's most popular shops and restaurants. The hotel is also situated near a number of local attractions such as Qiyi Street, Lijiang Dayan Ancient Town, and Lashi Lake. 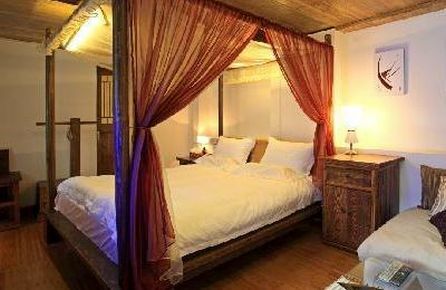 Lijiang Flower Inn has 10 comfortable guest rooms featuring bright Chinese-style décor and simple furnishings. Each room comes equipped with a shared bathroom, balcony, satellite TV, and free wireless internet access. The Lijiang Flower Inn features a wide range of amenities, including a common lounge area, airport transfer service, guided tours, bicycle rental for guests who want to explore, gift shops for souvenirs, laundry service. The hotel also offers a restaurant serving regional cuisine with available 24-hour room service. Lijiang Flower Inn in Lijiang! The Bivou Lijiang Hotel is located just 7 km from downtown Lijiang, near all the town's major attractions such as the World Cultural Heritage Garden, the Museum of Tea Horse Road, and Lijiang Shuhe Ancient Town. The Bivou Lijiang Hotel has 15 comfortable and spacious guest rooms featuring modern décor and furnishings with traditional Chinese accents. Each non-smoking room comes equipped with a private bathroom, sitting area, free wireless internet access, and complimentary bottled water. Select rooms also offer a kitchen or terrace. Guests of The Bivou Lijiang Hotel are encouraged to the hotel's many fine services and features, including massage sessions, kids club, beautiful courtyard with garden, bicycle rentals for guests who want to explore, guided tours of local attractions, and laundry service. The hotel also features a café, full-service bar with relaxing lounge, and a restaurant with available room service serving traditional regional cuisine. The Bivou Lijiang Hotel in Lijiang! 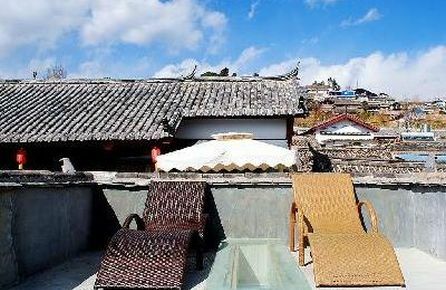 The No.188 Boutique Hotel is located right in the middle of downtown Lijiang, amid all the excitement the city has to offer. This 5-star hotel is situated within walking distance to the city's major attractions, including Qiyi Street, Lijiang Dayan Ancient Town, and Mufu. No.188 Boutique Hotel has 10 comfortable and uniquely designed 2-storey guest rooms featuring tasteful décor and hardwood floors. Each well-appointed, non-smoking guest room comes equipped with a private bathroom with separate shower and bathtub, satellite LCD TV, and complimentary internet access. Guests of No.188 Boutique Hotel will enjoy the hotel's wide range of amenities, including guided tours of local sites, airport transfer for convenience, laundry service, and a peaceful courtyard with beautiful garden. The hotel also offers a café, full-service bar, and a restaurant serving delicious regional and international cuisine. No. 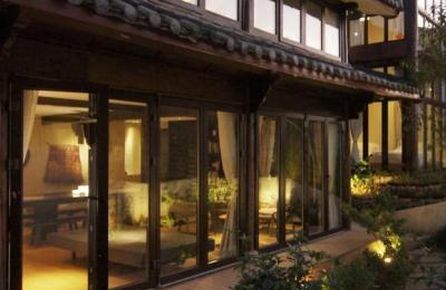 188 Boutique Hotel in Lijiang! The Lijiang Jun Bo Xuan Boutique Guesthouse is located on the popular Qi Yi Street in the town of Lijiang, home to many of the area's best dining, shopping, and entertainment options. The hotel is situated near a number of local attractions and historical sites, including The Mufu, Lijiang Ancient Town, the World Cultural Heritage Garden, and the Museum of Tea Horse Road. Lijiang Sanyi Airport is also just 22 km from the hotel. 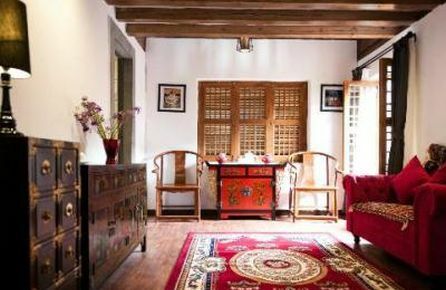 Lijiang Jun Bo Xuan Boutique Guesthouse has 10 comfortable and spacious guest rooms featuring classic contemporary décor with Chinese influences. Each bright room comes equipped with a private bathroom with robes and a large bathtub, sitting area, and free wireless internet access. 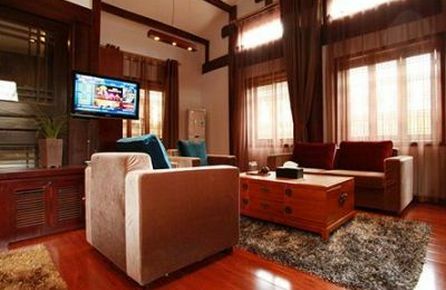 The Lijiang Jun Bo Xuan Boutique Guesthouse features professional service and a wide range of amenities to satisfy all guests, including babysitting service, shuttle to local sites, TV lounge and laundry service. Lijiang Jun Bo Xuan Boutique Guesthouse in Lijiang! The Lijiang Lize Graceland Artistic Suite Inn is located in the heart of the town of Lijiang, within walking distance to a number of the city's most popular attractions, including Lijiang Dayan Ancient Town, Yulong Snow Mountain, The Mufu. The hotel is also situated near Qi Yi Street, home to many of the city's best dining, shopping, and entertainment options, and just 22 km from Lijiang Sanyi Airport. Lijiang Lize Graceland Artistic Suite Inn has 9 comfortable and spacious 2-storey guest rooms featuring traditional Chinese décor with modern amenities. Each well-appointed room comes equipped with a large private bathroom, TV, microwave, washing machine, and free wireless internet access. Guests will appreciate the hotel's friendly and helpful staff as well as the variety of features and facilities, including a common lounge area, airport transfer, bicycle rental, guided tours, babysitting, and concierge. The Lijiang Lize Graceland Artistic Suite Inn also offers a full-service bar and a restaurant serving gourmet regional cuisine. Lijiang Lize Graceland Artistic Suite Inn in Lijiang! The Lijiang Sunny Riverside Boutique Hotel is located right in the middle of the town of Lijiang, within walking distance to almost everything the city has to offer. The 5-star hotel is situated just off of Qi Yi Street, home to the city's most popular shopping, dining, and entertainment options, and near all the major attractions, including the Mufu, Lijiang Ancient Town, the World Cultural Heritage Garden, and the Museum of Tea Horse Road. 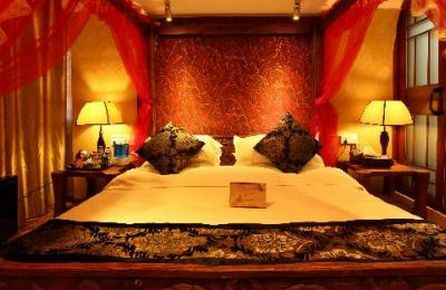 Lijiang Sunny Riverside Boutique Hotel has 21 comfortable and spacious 2-storey rooms, featuring colorful Chinese décor and rich wooden furnishings. Each room comes equipped with a private bathroom, balcony, LCD TV, and free wireless internet access. Guests are encouraged to take advantage of the hotel's many features and services, including laundry service, airport transfer, common lounge, guided tours, relaxing café, massage services, beautiful garden, and 24-hour room service. Lijiang Sunny Riverside Boutique Hotel in Lijiang! The Menghui Lijiang Inn is located in the heart of the town of Lijiang, a short walk to all the vibrant city has to offer. hotel is situated just off of Qi Yi Street, home to the city's most popular shopping, dining, and entertainment options, and near all the major attractions, including the Mufu, Lijiang Ancient Town, the World Cultural Heritage Garden, and the Museum of Tea Horse Road. Menghui Lijiang Inn has 11 comfortable and inviting guest rooms featuring colourful Chinese-inspired décor and modern amenities. Each well-appointed, non-smoking room comes equipped with a private bathroom, TV, complimentary bottled water, and free LAN internet access. Guests of Menghui Lijiang Inn will enjoy the helpful and professional staff as well as the hotel's wide range of features, such as a shuttle to local sites, guided tours of major attractions, laundry service, airport transfer, and concierge. The hotel also features a café, full-service bar, and a restaurant serving regional cuisine with available 24-hour room service. Menghui Lijiang inn in Lijiang! The Lijiang Emerald Boutique Hotel is located located right in the middle of the town of Lijiang, within walking distance to almost everything the city has to offer. The modern hotel is situated just off of Qi Yi Street, home to the city's most popular shopping, dining, and entertainment options, and near all the major attractions, including the Mufu, Lijiang Ancient Town, the World Cultural Heritage Garden, and the Museum of Tea Horse Road. 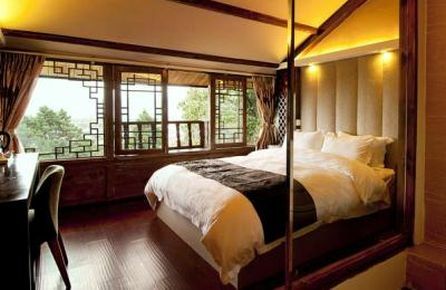 Lijiang Emerald Boutique Hotel has 14 bright and spacious guest rooms featuring modern and elegant décor. Each comfortable and well-appointed guest room comes equipped with a large private bathroom, sitting area, LCD TV, and free wireless internet access. Guests of Menghui Lijiang Inn will enjoy the helpful and professional staff as well as the hotel's wide range of features, such as a shuttle to local sites, guided tours of major attractions, laundry service, airport transfer, and concierge. Lijiang Emerald Boutique Hotel in Lijiang!